With its smooth, clean silhouette, Pinstripe Pure evokes a sense of relaxed luxury and vintage 1930s American style. This valve trim with bold lever handle is easy to operate, and features soft, clean edges for a bold accent in the shower. 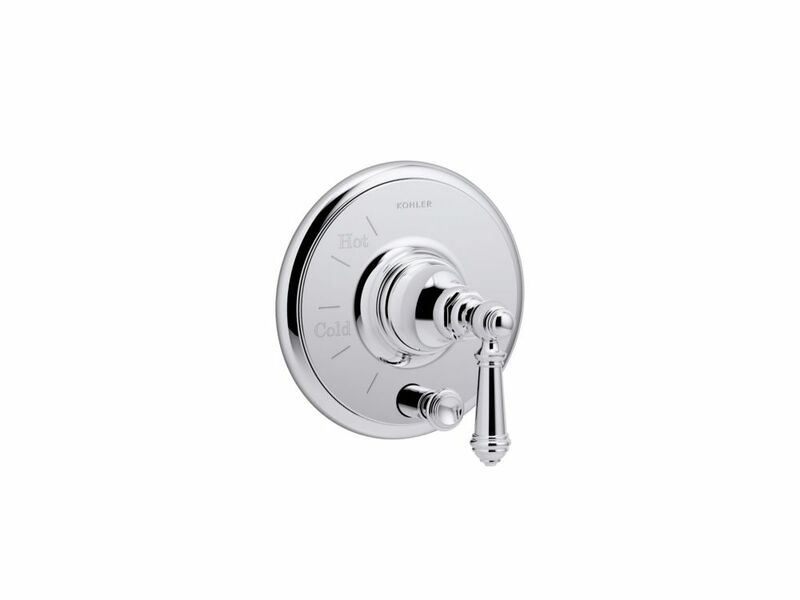 Pair this trim with a MasterShower(R) thermostatic valve for precise water temperature. Purist faucets and accessories combine simple, architectural forms with sensual design lines and careful detailing. Both sculptural and functional, this Purist Rite-Temp valve trim promises inviting visual appeal and an honest interpretation of classic modernity, and features a lever handle. Also available in store by special order only see store for details. Artifacts Rite-Temp Pressure-Balancing Valve Trim In Polished Chrome Create a look all your own with the Artifacts collection. Timeless and classic in its inspiration, Artifacts allows you to coordinate faucets, accessories, showering, and finishes to express your personal style. This Artifacts valve trim combines quality craftsmanship with a vintage artisan design to lend character and authenticity to your showering space. Pair this trim with a Rite-Temp pressure-balancing valve, which maintains your desired water temperature during pressure fluctuations. Artifacts Rite-Temp Pressure-Balancing Valve Trim In Polished Chrome is rated 4.0 out of 5 by 1. Rated 4 out of 5 by SteveVA from Beautiful and easy to install Used this level and trim kit for a bathroom remodel to go with the sink faucet, etc. Behind it I installed the corresponding Rite-Temp valve (K-11748-K-NA). It was packaged very well and the instructions were good. The plate was easy to install. I followed the directions and applied caulk behind the plate but I also put caulk all around the plate where it met the tile. The different adapter to attach the level to the valve (depending on wall thickness) were very nice and convenient. The lever was a little tricky to screw on but I got the hang of it. It was easy to remove and re-add the lever to adjust the water temperature later without taking more off the trim apart. The majority of the fixture is metal which is great. It is also very stylish. The trim and lever are very expensive though.